It’s not all about delicious street food, sweet treats and tasty beverages at this year’s Paisley Food and Drink Festival. 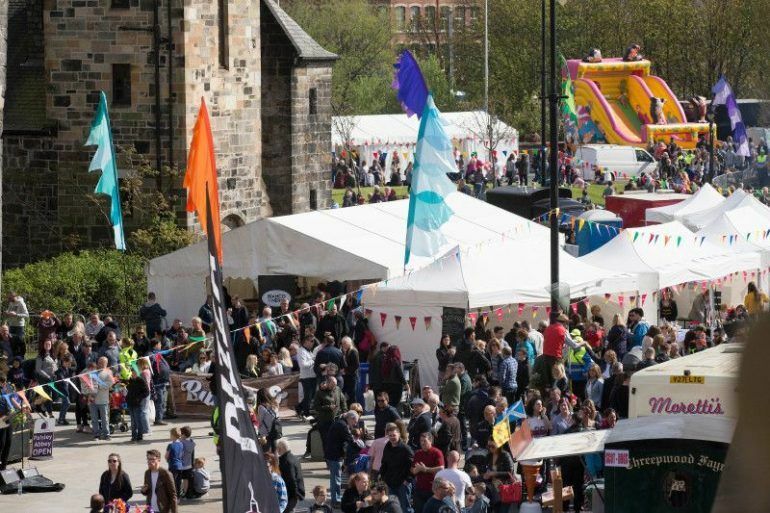 As well as wonderful aromas, Paisley’s Abbey Close will also be filled with live music and entertainment as part of the festival on Friday 27 and Saturday 28 April. Local music studio and media service, Brick Lane Productions, will present a fantastic line-up of buskers, musicians and bands to provide the ideal soundtrack to your culinary experience. Friday kicks off with an Unplugged Session with the Paisley Open Mic Collective and support from The Rubenesques from 4pm to 8pm. The Live Stage will be packed with top talent from 12pm on Saturday including entertainment from children’s favourite, Mr Bloom, and headliners, Beatles tribute act, Beatlemania. Uncut, who are made up of youngsters from Brick Lane and local charity and music school Loud n’ Proud, world music band The Pilgrim Society and contemporary folk harmony duo Mandulu and Hepzibah will delight the crowd during the afternoon. The acts will also be joined by indie rockers Freakwave and the 80s electro pop-inspired Reality TV, before a blast from the past with classic rockers Audio Rayz. There will also be a special Busking Station on Saturday with a host of top local talent performing across the afternoon, including Lisa Kowalski, The Highway Chile, Hollie Robinson, Zoe Tate and more. Make sure you sample some of the great sounds at the festival as well as the delicious food and drink on offer. From tasty street food vendors to fantastic workshops and entertainment, here's why you should definitely be at Paisley Food and Drink Festival this weekend.